what if aliens were hunting life outside their own planet? Armed with telescopes only a bit bigger and more powerful than our own, could they peer through the vastness of space and lock in onto Earth as a likely home to life? Thatâ€™s the question at the heart of paper co-authored by a University of Florida astronomer that appeared recently in the online edition of Astrophysical Journal. The answer, the authors say, is a qualified â€œyes.â€ With a space telescope larger than the Hubble Space Telescope pointed directly at our sun, they say, â€œhypothetical observersâ€ could measure Earthâ€™s 24-hour rotation period, leading to observations of oceans and the chance of life. As the writeup notes, the motivation for this line of inquiry is to optimize the earth-based search for extrasolar planets harboring life. It occurs to me however that we’ve already an example of a single-pixel view of earth – the famed Voyager 1 photo of the Earth from a distance of 4 billion miles, labeled by Carl Sagan as a “pale blue dot“. I’ve cropped the original photo at right, click to see the full field and appreciate just how tiny that dot is. At that distance, Earth is only 0.12 pixels in size. 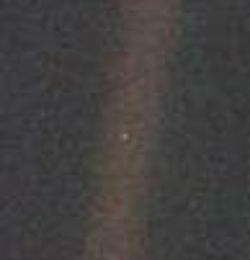 The streak is an chromatic artifact, and not “the view through Saturn’s rings” as some have erroneously described it. There’s a lot of data in that single, pale blue pixel.